Whether it’s a relaxed easy going river excursion, or an exhilarating voyage on the big blue in a sea kayak, or tossing and bouncing rides on a white-water river, Inishowen is perfect if your idea of fun is travelling by paddle power. And depending on conditions, sea kayaking and canoeing is a great activity for all the family. The Just Kayak team run one of the top Canoe events in the County with the ‘Crana Canoe weekend’ every October. 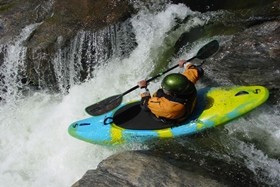 Kayak and canoe courses aimed specially at the beginner. From half day taster sessions, one day guided kayaking trips or weekend structured coaching courses, we guarantee you’ll leave wanting more. By creating a relaxed safe fun environment with skilled and experienced coaches we feel your first steps in kayaking will be enjoyable and exciting. We have extensive knowledge of the coast waters around Inishowen and we take full advantage of this glorious coastline.